December 1, 2018 December 1, 2018 haringeywelcomeLeave a Comment on Haringey commits to Welcome! 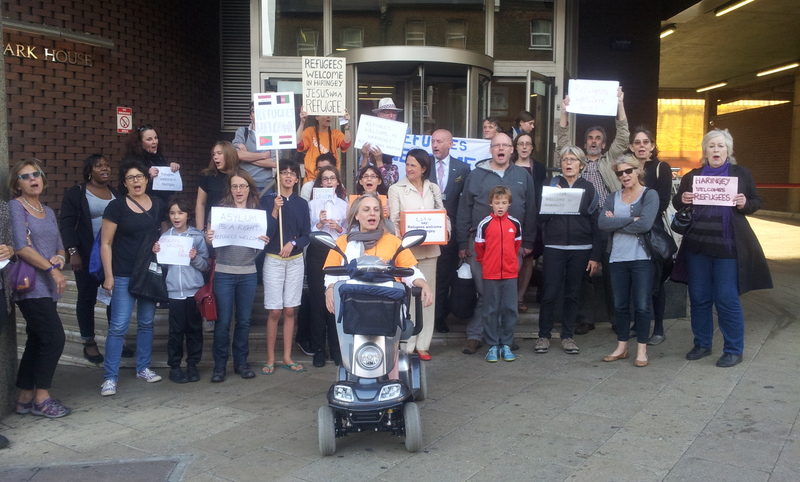 particularly vulnerable refugees and migrants;’ and that ‘’Hostile Environment’ policies are unjust and have no place in our society.’ The is the exciting start to a process that Haringey Welcome has been campaigning for over the last fourteen months. celebrated; we monitored the implementation; and then we thought What next? that time was more or less unknown: hostile environment. A direct quote from 2012 and the then Home Secretary, Theresa May, who announced that she wanted ‘to create here in Britain a really hostile environment for illegal migration.’ Which has meant recruiting healthcare workers, council officers, employers, landlords, schools and anyone else dealing with the public as de facto immigration officers. The Windrush generation scandal has demonstrated appallingly the impact that has had. In September, supported by the brilliant community organisers of Migrants Organise, we met with our colleagues for a planning session. We would relaunch, very publicly, as Haringey Welcome. We would focus on the local elections, due in May 2018. We would produce a pledge, to keep Haringey welcoming, and get everyone we could to sign it: our two MPs, prospective councillors, members of the public. Then when a new council was elected, we would try to persuade them to act on the pledge. stunning results. 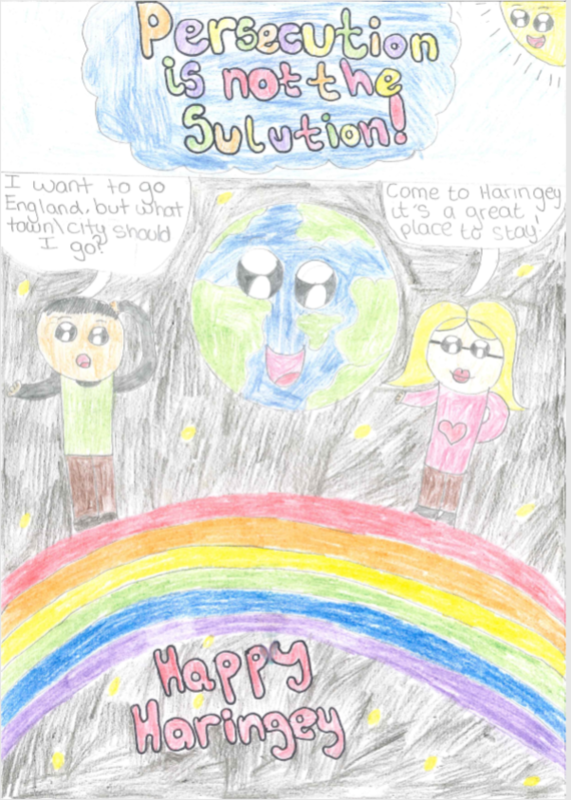 We’re still using the slogan from the first prize winner: Persecution is not the Solution. Local press and London Live TV picked up on the event. We were underway. Between the launch and the May elections we met with as many candidates as we could, and hosted an information session on the hostile environment. Many people were clearly unaware of it, including its implementation in Haringey, and were appalled. We were delighted that so many candidates who supported our campaign were elected. Now it was a question of turning the pledge into practical reality. We met one-to-one with as many councillors as possible, outlining our vision of a welcoming Haringey, and hearing about their own vision and their concerns. In September we invited those we’d met to a further planning session, again with our partner agencies from across the borough. What has to happen, we asked them, for the Council to adopt this vision in principle and implement it in practice? A motion to the full Council; inclusion in the next Borough Plan; an audit of services. Lib Dem and Labour councillors alike supported the idea; it was just a question of turning it into reality. 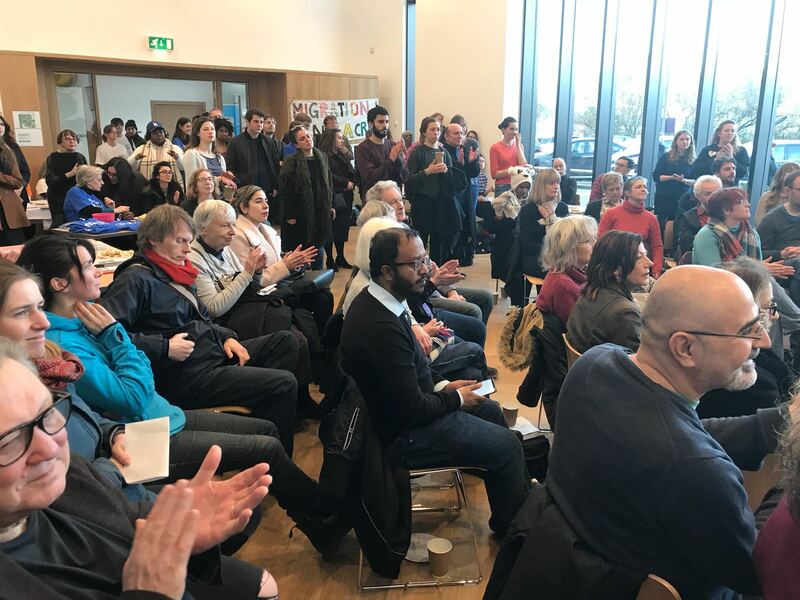 That together with local civil society we must ensure that good processes are in place to enable integration and inclusion, so that Haringey is a truly welcoming borough for all its residents. Several steps towards implementing these values are included, including prioritising welcome, integration and inclusion in the next Borough Plan. The Council has also committed to working with other local authorities to try and persuade the government to end the hostile environment. On Tuesday night our Co-ordinator, Lucy Nabijou, sat in the gallery observing the debate, and sending updates by WhatsApp to other members. At 9.58 Lucy messaged ‘Unanimous vote for amended motion!!! !’ And the rest of us, ordinary Haringey residents, volunteer campaigners, in our various homes across the borough, began to celebrate.